Another machine: the Wheel of Fortune. 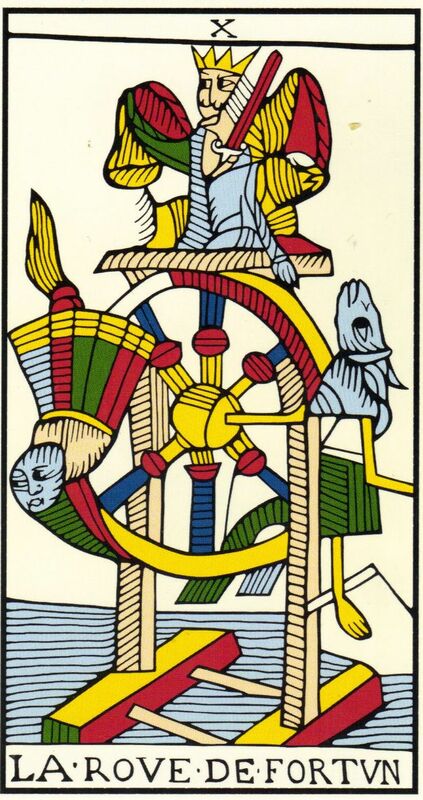 In the Marseilles Tarot, a late mediaeval set of divination cards, it is depicted as explicitly mechanical, a thin spindle holding a set of fat sculpted spokes which themselves support a twisting, mobius-strip wheel. A king, a dog and a ghost or spirit revolve, symbolising changing luck, poverty turning to wealth before returning again. Perhaps the King is actually the Goddess Fortuna, controlling its turn. In their discussion of artificial intelligence and the occult, Natalie Kane and Tobias Revell refer to the role of the tarot and early modern spiritualism in allowing women to speak candidly and forthrightly on issues of which women were culturally and socially excluded. When a woman speaking as herself on politics would find herself inviting persecution and silencing, a woman channelling the spirits could find a crack in which to assert her own ideas. This isn’t me raising these ideas, she could claim. It’s the otherworldly, our dead sharing their knowledge. Slipped under the thin shroud between the living and the dead were ideas of feminism, abolitionism, libertarian communism. The occult is an unplaceable relationship between the material and spiritual; it is words shaping reality. This is because allegory matters, Kane claims. It’s not hard to see the links between the occult and the programmed, between these two forms of words and rituals producing material and real-world change. It’s to allegory and metaphor that we turn to make sense of the uncertain distance between the two. The third of sci-fi writer Arthur C. Clarke’s ‘Three Laws’ is now so ubiquitous as to be a truism, but when he claimed “any sufficiently advanced technology is indistinguishable from magic”, he was hitting on an important point about how we interact with consumer technologies that we cannot fully explain. Unable to see our own relationship with the object — unable to understand how it ‘actually’ works — we simply write it off as ‘magic’, and in doing so, stop asking questions not just about how it is made, but how it might affect us, and how we might challenge its power. It becomes unknowable. Magic resurfaces in a talk by artist James Bridle on the development of self-driving cars, and their relationship to society. Bridle talks about the invention of the first self-driving car by Francis P. Houdina, a 1926 Chandler whose every gear and pedal could be controlled by an operator driving close behind the car in a vehicle fitted with a transmitter. The development of the car by the Houdina Radio Control Co. drove stage magician Harry Houdini mad with rage. He felt Houdina was trading off his fame with the soundalike name in an act of intentional parasitism, and turned up at the company offices, smashing furniture and threatening the designers. But perhaps Houdina was closer to the magic than Houdini, and today self-driving cars are on the verge of mass-rollout. Bridle refers to the story of Joshua Brown, an enthusiast for self-driving cars, who died in a head-on collision with a white truck that his Tesla S had failed to distinguish against a bright sky. Brown had ignored seven separate warnings from his car, requiring him to place his hands on the wheel. His faith in the magic was too strong, and when the truck driver jumped out of his cab following the crash, he could hear the sound of a Harry Potter movie emanating from the wreckage. Brown had been watching the film on a DVD player, instead of driving his car. “By the closing years of the century the first serious attempts will be made to achieve the direct electronic control of individual vehicles. Experimental schemes have already been visualised in which each car is hooked by radio on to an electronic signal transmitted from a metal strip in the centre of the road, obeying its commands and matching its speed to a computer-controlled traffic flow. Perhaps, given who he was, there was too much emphasis on the freedom offered by the private car. His vision of dystopia revolved around very mid-century concerns of totalitarianism and centralised control. Our dystopias, approaching at speed and with no hands on the wheel, reflect our concerns with the social atomisation and individualisation, trends currently driving social change under neoliberal social and economic systems. Consider taxi-hailing app ‘Uber’, whose London existence, Bridle points out, has hung in thebalance in this very chamber. It’s not simply that Uber has challenged the historical hegemony of the black cab as the primary private form of public transport in London. Its whole system, operating at a loss, is based around an attempt to destroy socialised forms of transport in able to wrestle a new monopoly from the destruction of social-democratic infrastructure. Once it has degraded public transport to the point of breakdown, it holds market control, and can rollout its new fleet of self-driving cars. For now, immigrant labour is marginally cheaper; once the balance shifts, the computers will take over, eminently reliable, unable to withdraw their labour. It is a sign of the times that the interjection of a state authority to uphold legal regulations aimed at defending passengers and workers came as a newsworthy shock. The political imperative raised by these technological developments is unmissable. It involves re-engaging with the ideas of magic, power and control, but also raises, as the most important question of our time, the demand “who is technological development working for?” Bridle raises the historical example of the Italian autonomists, who, in the middle of the 20th century, began asking these questions with relation to the automation of Italian industry. What is the relationship between the desire of the worker for social change, and the desire of industry for profit-increasing technological change? Rather than workers’ struggle responding to technological change, they argued, perhaps it is rather that capital responds to workers organisation by removing the worker from the productive process wherever possible. But technology can be the tool of resistance as much as the tool of capital accumulation. He recalls the case of autonomists in Bologna who used stolen traffic light keys to turn all of the city’s lights red on the occasion of a visit by Prime Minister Andreotti. The city turned to gridlock; it was the 20th Century equivalent of locking the city gates, leaving the Prime Minister trapped on the tarmac of the airport, unable to deliver his political address. These questions are as old as industrialisation; the term Luddite, now colloquially used to refer to those who hate technology, refer to the working-class followers of the mythical General Ned Ludd. Under his non-existent leadership, the Luddites broke into factories where new weaving technologies were automating their livelihoods out of existence, smashing the looms in order to protect their families and way of life. They weren’t opponents of technology; they were enemies of the capitalist class who were driving them to poverty and starvation by using technology in the service of private profit. The question of a modern luddism – a questioning of “who does this technology work for” — is raised early in the day in a conversation between Shuddhabrata Sengupta of Raqs Media Collective and computer scientist Anupam Guha. Discussing the role of artificial intelligence in the automation of tasks previously reserved for humans — affective labour and traditionally white and pink collar roles — they tackle the larger social questions that automation throws up. “Why are we so certain that the only sort of economic superstructure that is possible is one that works around employment?” Guha asks. Is it not possible to change how we assign and distribute resources using technology, and, once we do, what sort of world do we want to build? The question is not about artificial intelligence, Sengupta says, but about how society is organised around technology. Luddism greeted the emergence of a proletarianised, industrialised society. It’s only fitting that it’s there at the end. To facilitate that, we need an expanded conversation around not just the technics but the metaphorics of this change, whether through our mythical proletarian Generals, or our liaisons with the spirit world, or whatever forms of magic we build for our new world. Only through becoming magicians can we manage technology indistinguishable from magic.